Personable, with a self-deprecating humor, David Dodell-Feder undertakes research that belies his easy-going manner. 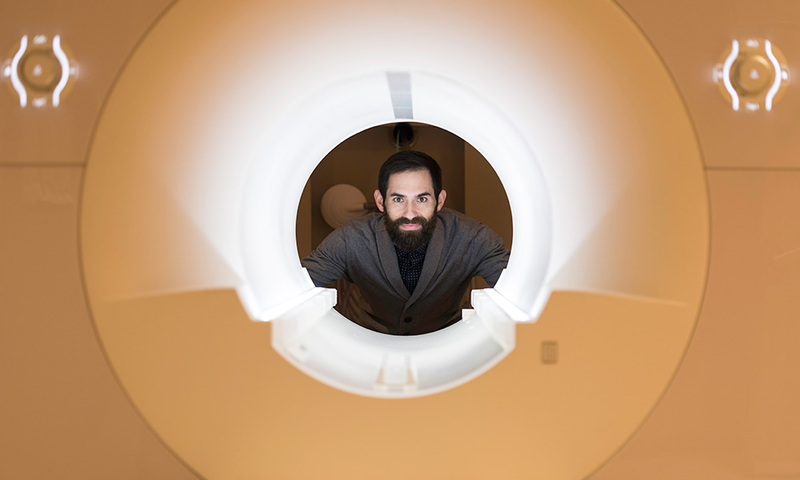 A new assistant professor in the University’s psychology department with a secondary appointment in neuroscience, he studies the processes that underlie how humans navigate the social world and how those processes go awry in people with schizophrenia. Every human’s physical and mental constitution demands social connection and social contact, but “large numbers of people don’t have that social connection and therefore don’t get to reap the benefits of having close social relationships,” says Dodell-Feder. That’s why people with schizophrenia have trouble forming, establishing, and maintaining healthy social relationships, romantic relationships, and relationships at work. As social animals, the extent of our social connection carries important consequences for our health and well-being, he notes. “When engaged in healthy social contact and rewarding social relationships, we thrive; when socially isolated, we wither.” Studies have shown that social isolation is associated with psychiatric illness, physical illness, and early mortality, making social disconnection a major public health concern. Dodell-Feder is one of 30 new faculty members joing Arts, Sciences & Engineering in 2018-19. Dodell-Feder is now trying to figure out why people with schizophrenia are experiencing these social difficulties. To that end, he focuses on one process in particular—theory of mind—by which humans attribute and reason about the mental states of others. It’s this group of processes that seems to be disrupted in people with schizophrenia, affecting day-to-day social behavior. Dodell-Feder is working to establish how exactly the neural mechanisms are impaired—a first step in designing any future interventions. His research involves neuroimaging, something that made the University with its Rochester Center for Brain Imaging (RCBI) under the new leadership of John Foxe, chair of the Department of Neuroscience, very attractive to him. And Dodell-Feder says he’s looking forward to working closely with schizophrenia expert Steven Lamberti, a professor of psychiatry at the Medical Center. The new job at Rochester marks a return for Dodell-Feder. “I just couldn’t resist the prospect of six months of winter,” the 32-year old jokes about Rochester’s abrasive climate. But then he knew what he was getting himself into: he had left the University in 2008 with a BA in psychology and brain and cognitive sciences. In the intervening decade, Dodell-Feder picked up a PhD in clinical psychology from Harvard University, followed by a postdoctoral fellowship at the Institute for Technology in Psychiatry at McLean Hospital in Belmont, Massachusetts, before returning to the University of Rochester’s Department of Clinical and Social Sciences in Psychology with a secondary appointment in the Medical Center’s Department of Neuroscience. The Queens, New York, native fondly remembers his favorite undergraduate class at the University—a seminar in humanistic psychotherapy, taught by psychology professor (and self-determination theory co-founder) Edward Deci. At his graduation ten years ago, Dodell-Feder had asked Deci for the honor to receive his diploma from his professor’s hands. Deci was happy to oblige. Little did either man suspect that just a decade later his favorite prof would be voting enthusiastically to bring Dodell-Feder back as a colleague. During his undergrad years in Rochester, Dodell-Feder followed his second passion—music. He took saxophone lessons for credit at the Eastman School of Music. While an “awesome” experience, he felt somewhat bad for those professionals who taught him. “I’m shocked they let me do it,” laughs Dodell-Feder. “I loved playing but, objectively, I wasn’t terribly good.” Yet, undeterred, he formed a jam band with friends on campus, played one semester in a chamber ensemble group, and for several semesters in a sax quartet. Ultimately, it was his love of saxophone playing that prompted the idea for his undergraduate honors thesis—a study comparing visual attention skills in musicians to non-musicians, hypothesizing that musicians would score higher. A great idea, he was convinced. But things didn’t quite go as planned. For starters, it was difficult to recruit enough musicians. Nothing. At least nothing interesting. “My sample size was just way too small to make any sort of conclusions or inferences from the data I collected, I’m sorry to say,” he grins. Nevertheless, the experience whetted his appetite for academic inquiry. Does reading fiction make us better human beings? Most recently, he’s been looking at the effects of fiction reading on people’s cognitive social skills, including the ability to feel empathy. Several studies have suggested that fiction reading serves as a way of priming humans’ social skills, while others found no effect. Dodell-Feder’s own meta-analysis of 14 studies confirmed that those people randomly assigned to read fiction performed better on a host of cognitive skills than those assigned to read non-fiction or nothing. Yet, while Dodell-Feder found a “robust” effect, he’s the first to admit that overall it was “tiny.” So small, in fact, that it might be the “type of effect that a lot of researchers would disregard as not necessarily meaningful,” he surmises. But for Dodell-Feder, who is looking to improve the social skills of people with schizophrenia with easily available, tolerable, and cost-effective treatments, a seed was planted. “The finding is important and at the very least deserving of additional research,” he says. The crux with the studies in his meta-analysis was that the test subjects had read fiction for a very short time, often just for five minutes. It’s possible, he reasoned, that the short reading duration accounts for the very small effects. That’s why this summer, together with co-investigator Diana Tamir, a psychologist at Princeton University, and supported by a grant from the National Endowment for the Arts (NEA), he set out to study 300 healthy adults, randomly assigned to read fiction (or non-fiction) over the course of four weeks, hoping for a greater measurable impact on social cognition. Data collection has just begun and the results aren’t in yet. Currently, he’s looking for a community partner in Rochester to test a similar hypothesis in adolescents to see whether fiction reading positively affects social and emotional development. Essentially the question boils down to this—does fiction reading teach you better social skills for the real world? Helping him in his quest for answers is a Brain & Behavior Research Foundation’s NARSAD Young Investigator award for $70,000, paid out over two years, awarded this fall. It’s for a project that employs real-time functional magnetic resonance imaging (rtfMRI) to see if social dysfunction in people with schizophrenia-spectrum disorders can be improved through neurofeedback. But all research aside, what’s Dodell-Feder going to do about the long winters? As an undergraduate, he says, it didn’t bother him as much, having spent much of his time working deep in the windowless stacks at Rush Rhees Library. This winter, however, he vows to be active outside—either snow shoeing, or trying out cross country skiing. A habit from his undergrad times that he won’t repeat any time soon? “Drink a Genny Light,” he says, referring to the somewhat watery but inexpensive, locally-brewed lager, a perennial favorite with students.